After having a delicious burger at White Spot, later that week I decided to try out White Spot's "sister brand", Triple O's (700 Hamilton Street, Vancouver). 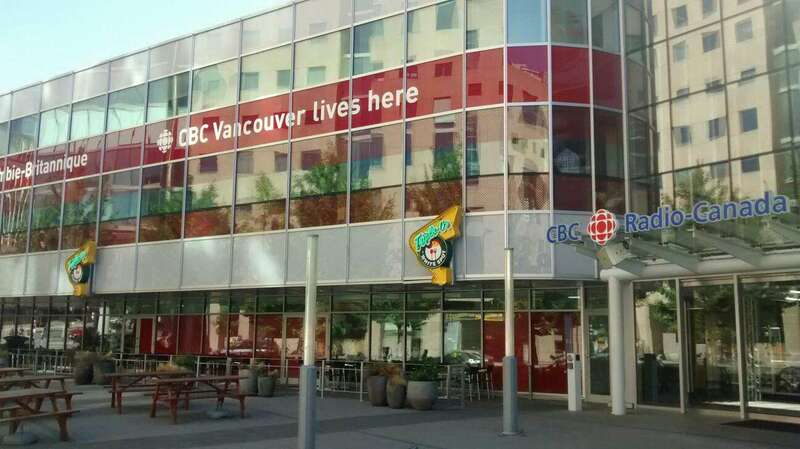 This Triple O's is located on the ground floor of the CBC building at the corner of Georgia and Hamilton Streets. 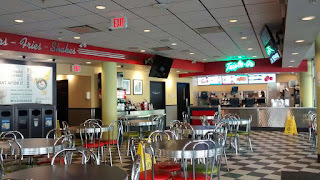 Despite being in an urban downtown area, the Triple O's is actually a spacious 50's or 60's diner inspired inside with a service counter at one end. Add to this a condiment and drink counter along another side the entire interior set up is like a McDonald's forced to combine operations with a diner. Being 11:30 a.m., I walked up to the counter and ordered right away. The Order: 1 Bacon Cheddar Cheeseburger with Fries and Coke. After ordering and paying, I was promised the order would be brought out to me but here was my soft drink cup that I could fill up at the fountain pop machine nearby. I filled my cup up and found a seat nearby. I logged into the free wifi to catch up on my usual rounds. But before I get much further, amazingly my order was being brought out! Who would of thunk it that ordering at a McDonald's like restaurant would let their customers go and sit with their drinks while their order was prepared and then bring it out them? The burger was similar to Harvey's hamburger except a little more juicier. 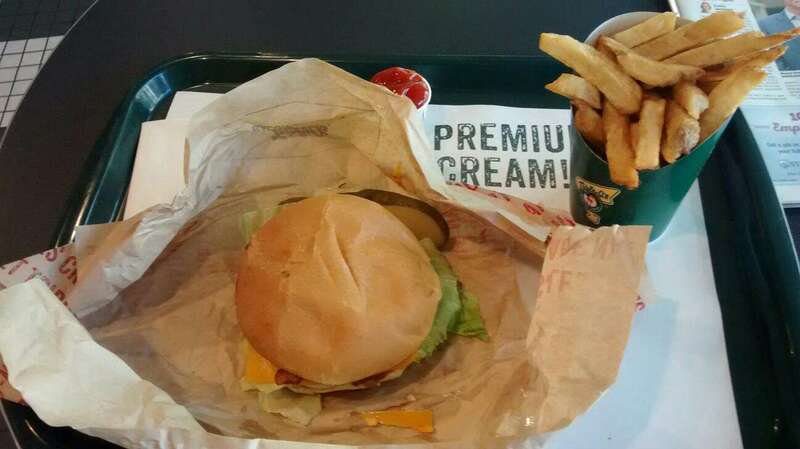 Of course, the "Triple O's Sauce" added a little more to a usual burger topped with cheese, bacon, lettuce and tomato. A decent burger experience. The fries were similar to the Harvey's & Swiss Chalet fries I've enjoyed in Ontario except a little thicker cut. 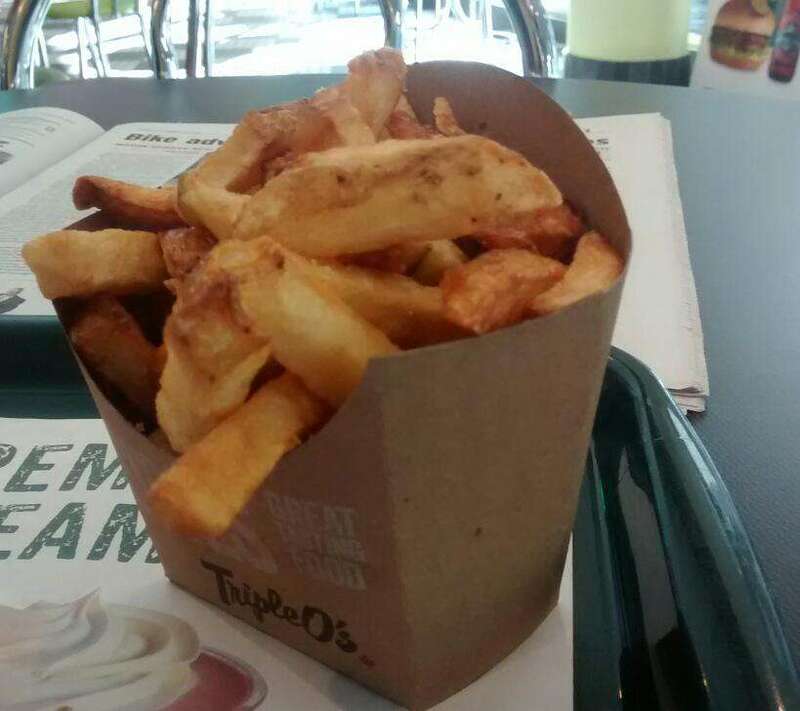 Pretty good temperature and taste wise pretty good with a small dose of ketchup. Overall, Triple O's has been a favourable experience. I've since been back a couple of times to this location to find friendly service a decent prices. 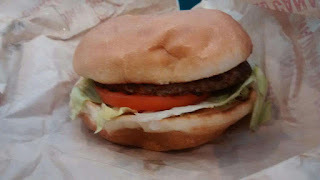 Tuesdays are the best days to go if you're looking for simple hamburger as they offer a Original Burger, fries and drink for $7 to $8 including taxes. 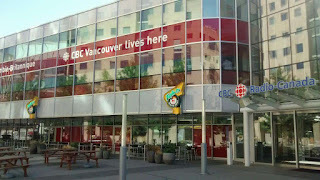 When in Vancouver, I'll return!